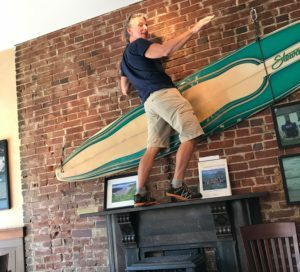 Why There’s a Surfboard and a Welsh Masterpiece on the Wall at Dressel’s. If you’ve been coming to Dressel’s long enough you will know something about it’s history and culture. Since 1980 the pub has celebrated something of the intellectual heritage of Europe and the new world. Jon and Barbara Dressel, inspired by the glory days of Gaslight Square, opened their second saloon to celebrate the Arts. Not many people know that the Dressel’s, with partner Jack Brangle, opened Llywelyn’s Pub around the corner in 1974. Dressel sold his share to Brangle three years later. Over time Dressel’s also became something of a Welsh pub serving good welsh beer and British inspired pub grub. However, with Jon Dressel holding his place nightly behind the bar, the pub had the authenticity of a true intellectual’s hang out. Dressel’s always was, and continues to be, a truly authentic establishment. As a 2nd generation owner I’ve tried to keep the best of the old pub while taking it in new directions, more true to my own interests and identity. Having lived many years in Wales, it made sense to emphasize the culture of Wales in the 2012 dining room expansion. Everything in the room comes from Wales. All of it has a significance and tells the story of our family and it’s relationship to Wales. 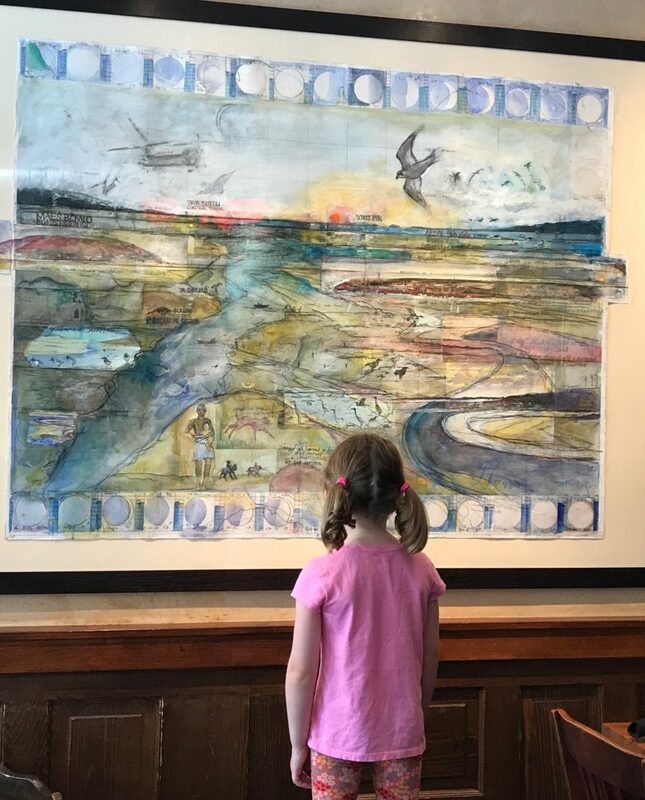 The large painting that takes center stage in the room is one of only three created by celebrated Welsh artist Osi Osmond. It’s a collage of watercolors he put together over 30 days painting from a hilltop overlooking the Carmarthen bay outside the village of Llansteffan, where I lived for many years. It speaks of the place over time and tide, rising and setting sun. It means as much to me as anything in the building as he was a friend and mentor. Wales lost a real treasure when he succumbed to cancer in 2015. Dressel’s owner, Ben Dressel, “rides the waves”. The Stewart long board mounted on the South wall returned to Saint Louis with Osi’s painting. I’m no poet or artist but many of my best days in Wales and beyond were spent with that board. It’s traveled the coasts of Wales, France, Spain and Ireland. It was shaped by a Californian in Cornwall and purchased new from another Welsh legend, surfer Pete Jones of Llangennith. In the land locked, no swell, sweltering days of the Saint Louis summer I look to it for comfort and inspiration.